Feathers are produced and supported by feather follicles which are located in the dermis of the pterylae. The hollow basal portion of the shaft of a feather that is implanted in the follicle, is called the calamus. The feather on the micrograph above is a contour feather. Centrally in the follicle we can see the air space surrounded by the calamus. Smooth muscles, the feather muscles (mm. pennati, mm. 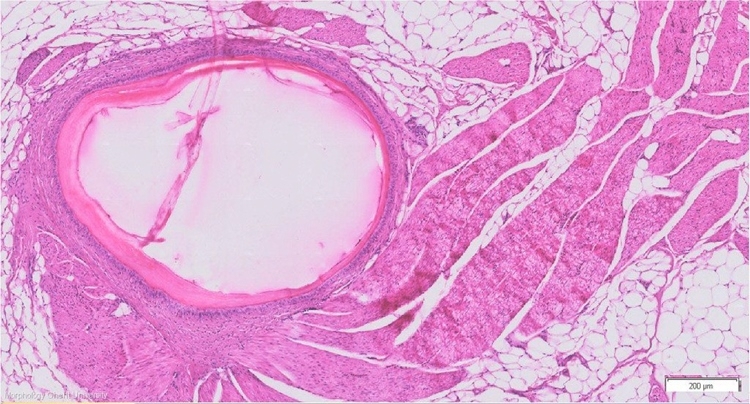 pennarum-NAA), end on the wall of the follicle. For more detail: see subgalleries of feathers.